A gorgeous, simple and classic cotton corduroy smock dress with added pocket feature. Can be worn in so many ways, a super diverse piece for any little girls wardrobe. 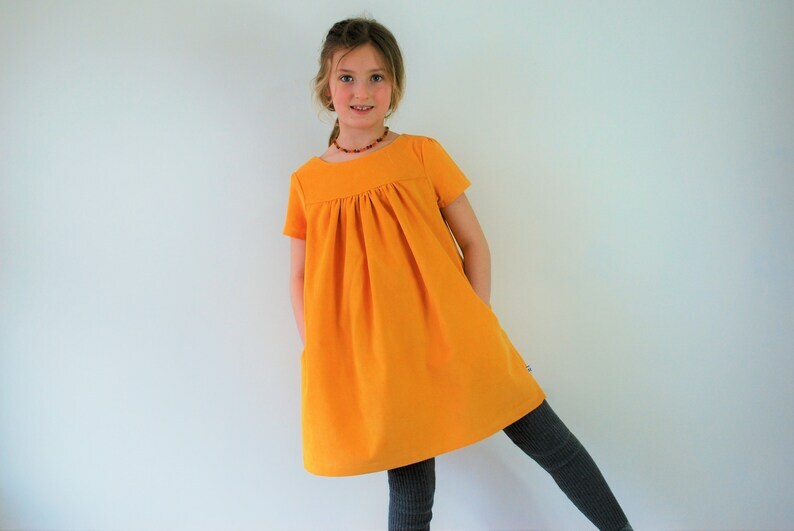 This listing is for one bright yellow 100% cotton, fine corduroy smock dress. These dresses are currently MADE TO ORDER - See shop policies for current turnaround time. Please choose the size you require from the menu on the right or by letting me know in the "Note to Nutkids" section during checkout. Available from 2yrs - 10yrs. I recommend that for prolonged life and to keep your garment looking fresh, you wash at 40 degrees with similar colours and where possible line dry. Deviation from this guidance should not cause major harm, but may have a longer term effect. All our fabrics have been prewashed prior to garment construction to avoid shrinkage and any potential running of colours, but please always take care when washing very deep colours.